NIWA makes the huge admission that New Zealand has experienced hardly any warming during the last half-century. For all their talk about warming, for all their rushed invention of the “Eleven-Station Series” to prove warming, this new series shows that no warming has occurred here since about 1960. Almost all the warming took place from 1940-60, when the IPCC says that the effect of CO2 concentrations was trivial. Indeed, global temperatures were falling during that period…..Almost all of the 34 adjustments made by Dr Jim Salinger to the 7SS have been abandoned, along with his version of the comparative station methodology. I should point out that “the huge admission” I mentioned referred to NIWA’s new graph, which, on examination, clearly shows very little warming since 1960. It was a non-verbal, graphical admission—but it is crystal clear, nonetheless. A graph falls victim to fewer errors of interpretation than mere words. a coalition group consisting of the NZCSC and the Climate Conversation Group (CCG) has pressured the NIWA into abandoning a set of temperature record adjustments of which the coalition dispute the validity. This was the culmination of a court proceeding in December 2010, last month. It’s ironic that Matt claims we pressured NIWA into “abandoning” the adjustments, when NIWA itself calls it a “replacement.” Throwing away the old series would nullify all the defending NIWA gave it over the last twelve months and their PR advisers have obviously advised against doing that. It’s important to correct this mistake; it’s very, very wrong. We did not object to the adjustment methodology, because we didn’t know what it was. We actually asked: “What is the methodology?” Note the big difference between disagreeing with a thing and simply asking what it is. Our paper takes two simple steps with data from NIWA’s web site (of the time): it graphs the raw temperature readings and it compares that graph with NIWA’s graph from the web site. They are very different. The “raw” graph shows no warming (actually 0.06°C—nothing to speak of), while their graph obviously uses adjusted data, because it shows about 0.91°C warming over the 20th century. Our paper asks what adjustments were made, and why they were made. Matt locates our post about the 7SS being taken off NIWA’s web site. It says “On the eve of Christmas, when nobody was looking, NIWA declared that New Zealand had a new official temperature record (the NZT7) and whipped the 7SS off its website.” However, I’ve already seen that this is not true. Perhaps there was once a 7SS graph and information about the temperature record on the site’s homepage that can no longer be seen. I don’t know. But it is true. Just ask NIWA, or compare the two graphs of the “NZ Temperature Record”. The old one is in our paper. But then he says he doesn’t know. I don’t know what Matt is really saying here, but it’s one of two contradictory things. Your organization has achieved a positive result and I think you should be proud of that, but you should limit your representations of success to reality. We thank him for his congratulations and are happy to take his advice. Matt’s done well in getting up to speed with a complex topic in a short time, and for that I commend him. But he hasn’t done it without mistakes, so he should pay attention to these corrections, and he has certainly overlooked our main objection to NIWA’s actions: their lack of simple honesty and openness and their refusal to apologise for what amount to professional discourtesies. Without looking too far ahead, I ought to mention that there are questions hanging over the report from the BoM on NIWA’s review. Principally, when will we see the original review document from the BoM, which obviously hasn’t been published yet? It would also be comforting to hear a more generous commendation from the BoM of NIWA’s work and methodology; so far they have been greatly uninspiring, leading to speculation that there’s something seriously amiss with NIWA’s work. We also want confirmation of which publication NIWA’s Review report will be published in and when, and the names of the report’s authors. Finally, the Coalition anxiously awaits the publication of the estimated margins of error for the temperature series. Thanks Richard. I’d like to respond to a couple of points. I’m not sure why you call me “uppity”. If I have any ideas above my station, I’d like to remind you that my aim as yours is to uncover deceptions and reveal truths. I have written on my blog, which has very few readers, and have commented on your own. You have found what I’ve written and written this piece. I believe if anyone has been propelled then it’s me. What does any of this have to do with people like James Delingpole? 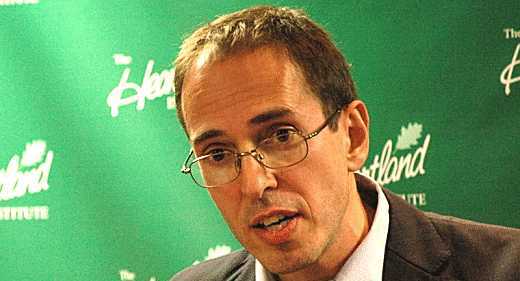 I’m sure Delingpole would be happy to lap up the misrepresentations of your press statement, and that’s the problem. This is a serious issue and misrepresentations (for which you cannot be held directly responsible) muddy the water and help to spread what we term “denialist” views. And yes, I use the term denialist as do many others when describing certain people. It is important to distinguish genuine sceptics who evaluate each piece of evidence on its own merits, from those who select only the evidence which suits their predilections. Denialists (not deniers) like Delingpole want to talk about conspiracy theories which cannot be proven or disproven. This is unhelpful. I’d rather talk about the science. There are a number of competing theories that have so far failed to gain wide acceptance. One very interesting theory is that warming and cooling can be tied to cosmic ray activity. Henric Svensmark is at the forefront of this research and it sounds very plausible. But James Delingpole doesn’t know about it because he doesn’t investigate the scientific research. He gets paid real money to write his drivel and I spend hours of my free time researching facts and trying to make sense of it all. In my dealings with you I stressed that I felt your press statements around the replacement of the 7SS series was misleading in that it suggested a reversal which closer inspection reveals to be untrue. It was a carefully worded release that may have been intended to misconstrue the result while remaining technically truthful. I have to give you the benefit of the doubt and take your word that you did not intend to mislead any press. This has however happened and I’ve thanked you for setting the record straight by acknowledging that you do not feel there was any dishonesty on the part of NIWA and that there was no retraction. I will correct the mistakes that you’ve pointed out. Thank you again. 1. Using “Denialist”, a derivative of “Denier”, is also unhelpful. What exactly is being denied? 2. “…as do many others…” is no excuse. It is simply wrong in spirit and in letter. 3. If it is so important to distinguish between genuine sceptics and non-genuine sceptics, it is also just as important to distinguish between genuine AGW supporters and ideologues on a bandwagon. Yet do I call the latter some derogatory name which also besmirches the former, as you do? No – I make specific comment on lack of scientific logic or hypotheses if I detect it. There is no need to use ‘Denier’ or any derivative thereof if you are truly concerned about the science. Simply state your scientific case, without emotive embellishment. That would be helpful. I have to agree with Bishop Hill here. The press release was pretty much repeated verbatim on BH. Oh, and every word of the press release was true. The graph really does show a lack of warming. In New Zealand, the class system our forefathers escaped from is very much diluted. Still present, because you always have different grades of behaviour and skills, which you might as well call “class” as anything else, but largely ignored. So the force of “uppity” is small, but was meant to contrast Delingpole’s widely-known name with your unknown one in a manner insulting to you. In addition, I used it with the same seriousness as I used “slayer”, which is to say with very little. Of course, you didn’t respond to slayer because it was so obviously a metaphor. I admire your aim of uncovering deception and revealing truth. It’s definitely the best use of one’s time, and look where it gets us—in discussion with intelligent people on the other side of the world. The use of “denier” or other ad hominem expressions is forever deprecated and I cannot approve it. The important matter is the evidence, not who brings it or your opinion of them. Cosmic ray flux does have an effect on cloud formation, and therefore it seems reasonable that it should affect insolation, and hence surface temperature. Time will tell. But even more compelling is evidence already available concerning sea level rise, air and ocean temperatures and cyclic climate influences which falsify the CAGW theory. Much of this information is available or linked to on this site. Another hit job I think. Monckton has just had his court injunction for a right of reply to the documentary refused. The doco on BBC4 just finished and I am hearing that it was the hatchet job on Monckton as expected. The BBC are really living up to their reputation as a one-sided propaganda machine. I am sure we can expect some crowing from our warmist friends over the road fairly soon, as their twittersphere starts chirping away. 1. The warmists are up the creek without one so they revert to bashing people. 2. Its all over. Beautiful graph from Dr Noor Van Andel empiracly PROVING CGR is a major climate driver. 3. The GHG theory is fatally flawed. (i.e. wrong). For what it’s worth, my investigations are revealing to me that there are many more genuine AGW sceptics with valid arguments than I had been led to believe. I will no longer use the term denialist or denier and apologize for any offence I may have caused. In exchange I would ask that people please refrain from using the terms “warmist” or “alarmist”. I would also like to apologize to Richard Treadgold as he seems to have gotten the impression that I was lumping him in with those who have distorted his statements. I can see how it would appear so, but that wasn’t my intention in that piece. I applaud the Climate Conversation Group for pushing to achieve clarity on a vague temperature record. The NIWA has a responsibility to make its methods public. Nevertheless, the press statements were misleading. Richard, please see my comment down the bottom. I watched the doc. Monckton gets no sympathy from me. Anyone who attempts to silence critics through libel action has nothing good to say about science. I look forward to much needed libel law reforms in England and Wales. He doesn’t want to silence anyone, he just wants 3 minutes (versus 60 minutes) to give his side of the story. Reading James Delingpole , I must say there is something to this. I have seen the BBC in action before, from behind the lens, and I can assure you this type of dodgy journalism is rife within that organisation. The bottom line is that one can make anybody look bad by following them around with a camera for months, and then selectively editing later. A right of reply is usually only necessary when the reporting has been one-sided. We hunted around and eventually found a water scientist in Inverness, who looked as if he might say it, so we took the crew all the up there from London. I went through the motions of interviewing him, waiting for him to say the words we needed. At the time, we were under huge pressure to catch the last flight back and the man would not say the words. So I talked around the subject, and kept re-phrasing the question, putting it to him again and again. Then, as we were getting more and more desperate, he said the magic sentence. He didn’t really mean it, but the way I had asked the question gave me the string of words I needed. The cameraman snapped off the lights, we threw the kit in the boxes and fled, rushing to catch our flight. The poor sod must have wondered what he had said to get such a response. When the film was broadcast, it had that one sentence in it. Nothing more from that man, even though he had talked for hours. Outstanding response, Matt. I have read your blog posts and you seem to have a genuine and diligent style. I hope you continue to drop by here. Outstanding and surprising. Thank you, Matt. As for me, I will use the term “AGW proponent” rather than warmist or alarmist. All the best Matt. I think you have shown sense and balance, something we could all do with on this subject. Ah, I see. I must say though in defence of Monckton that Abraham’s presentation wasn’t very good. It’s worthwhile to watch Monckton’s rebuttals on Youtube, before stating definitively that Abraham pointed out errors. Many of the “errors” were in fact strawmen, and Abrahams makes quite a few errors of his own. Okay, but again it’s bad form to resort to libel in science debates. I’m sensitive to this because I am a campaigner for free speech issues, mainly to do with the use of the web and social media. Fair enough, but is it OK to say anything you like about a person, even if what you say is completely incorrect, and will be used by the unthinking masses to form an opinion about that person? Yet it wasn’t, in actual fact. Abraham was incorrect in almost all his points. But people go around citing Abraham as having destroyed Monckton. Nobody bothers to see what Monckton said in reply. Free speech presumes that all parties have free access to the same soapbox. But it’s not always the case. Hence the need for slander and libel laws. They’ve been in place in most civilized societies for a very long time, for good reason. Quite true and I support libel law as a concept. Unfortunately in England and Wales the law puts the burden on the defendant or respondant to prove that the speech act is truthful. This makes it very lobsided and corporations and individuals with lots of money are able to silence detractors just with the threat of libel action. I would imagine that Monkton could use the same tools to get his reply out there as Abraham did and this could be amplified by his supporters. I’ll have a look at the reply and see how that stacks up before I jump to any conclusions about it. I see Anthony Watts saw them coming and told them to stuff off. Good on him. The problem for the BBC is that the readerership of WUWT is probably somewhat larger, and certainly more international, than the viewership of the BBC4 programme itself. If you Google “BBC4 Meet the Sceptics” you will find only negative commentary in the top hits (apart from programming schedules). So it is more likely to have damaged the BBC than the sceptics. Next time the BBC approach sceptical scientists like Lindzen, they are unlikely to get an interview. By making a caricature of Monckton, Delingpole, and climate scepticism, the BBC reveals itself as the same kind of beast it attempted to slay: given to dogma, unwilling to countenance either debate or dissent, and failing to reflect on its function as an impartial broadcaster. It could be all the things it mocks in Murray’s film. It could be Fox News. It could be the homophobic bigot. It could be the religious zealot. — Ha ha ha. It was way upthread. Fixed. RT. A couple of us who comment on this blog contributed to her “IPCC Citizen Audit” last year, where we painstakingly went through the IPCC references and counted up the number of peer-reviewed items.The total was bout 1/3 non-peer reviewed. I’m sure Donna would welcome any feedback on free-speech issues. Thanks for the warmth. You guys are all right. I’m glad you think so and I hope you stick around; we might learn something! I accept your apology, since the press release ought to have pointed out that the source of NIWA’s ‘statement’ was in fact a graph. I shall be more prudent in future. We appreciate your support for our campaign against vague temperature records. It puts me in mind of Gordon Ramsey’s Campaign for Real Gravy! So I shall launch the Campaign for True Temperatures!